A few years ago, Matagot contacted me directly for work on the English translation of an upcoming game. It was the first time they'd done so (but not the last). I did my usual - I read the rules, I suggested changes, and I sent it back. I thought it looked like fun, but I wasn't sure. Time passed, and I received my contributor copy - but I managed to get one of those flukes that I often get - my copy was missing a part. I have terrible luck, which has led to my having first-hand knowledge of how dozens of companies handle customer service for defective things. But when I received my replacement, I was in the middle of a project. So I set it aside and vowed to get to it later. When it finally hit the table, we played the fully-cooperative game and it was ... okay. I guess. But the rules have multiple modes of play, one of which was a semi-cooperative game. It looks like it had potential, so I eventually talked the group into giving it another shot - and man I am glad I did. Room 25 has rapidly become one of my favorite games for up to eight players. Now, before you get too excited, note that you need the Season Two expansion to hit eight players. And the photos below show the figures and some rooms from the expansion. In Room 25, players each control a character who is participating in a game or reality show. This show, however, has more in common with The Running Man than with Jeopardy! Throw in a healthy dose of Cube, and you've got the game. The goal is to escape the maze with the rest of the party. Even in the cooperative mode of play, it's not easy. Each turn, you have to pre-program one or two actions, which will be resolved in order. Those actions are Move, Peek, Shove, and Slide. Move allows your character to move into an adjacent room. Peek lets you look into an adjacent room. Shove lets you push a character into an adjacent room. Finally, Slide lets you move the rooms around. You want to move and reveal rooms - but you don't want to charge into just any adjacent room, because some rooms will kill you. And if too many players die, the other players can't win. Other rooms will slow you down, disorient you, or prevent table-talk. Rooms can move you around, or make passage impossible without help. Speaking of table-talk - when you peek, you can't tell others what the room is. All you can do is share the color of the room. Rooms are Red (deadly), Yellow (inconvenient), Green (beneficial), or Blue (Room 25 and the start room). 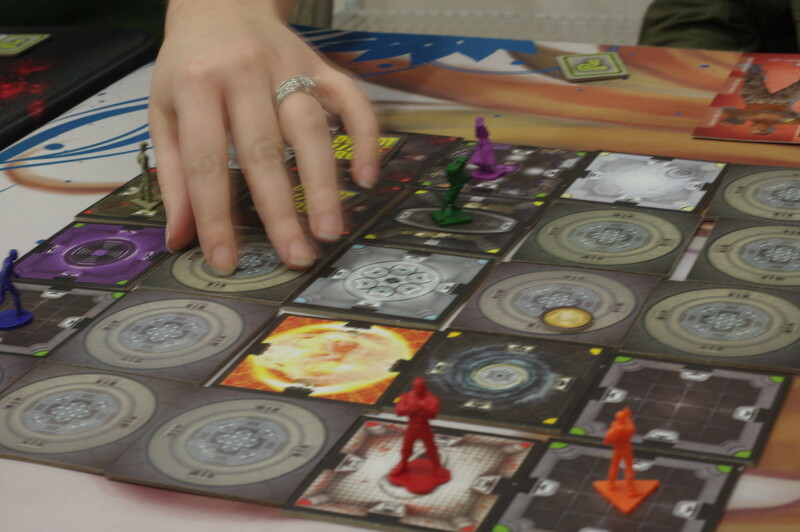 The reason you want to reveal rooms is because the only way to escape is to get everyone into Room 25 and then slide the room off of the board. And - again - you have a limited amount of time in which to do so. And - I'm going to say this again - the cooperative mode is so-so, but it's worth playing to figure out how this game works. Because if you just dump everyone into the semi-cooperative mode, you're not going to do very well. This game also allows for team play, and, best of all, semi-cooperative play. But the semi-cooperative mode is absolutely worth the time spent learning the basics. It adds a few details - there is a player who is a traitor (called a "Guard"). The goal of the traitor is to keep the other players from winning. In an eight-player game, there might be two Guards. It means that players suddenly can't trust one another completely. If I say a room is Green, is it Green or am I trying to lure you into it? The pre-programmed nature of the game can work against players, too, because you must take a programmed action, if possible. So if you program a Peek and then a Move, but the board shifts before you Move, you might not have any good choices for that movement. But the Guards can choose to reveal that they are Guards, which means they no longer need to pre-program their actions. It's powerful, but other players who know you're the Guard will try to shove you into deadly rooms or shift the board to move you away from the rest of them. Of course, you're trying to do the same, but while trying to make it look like an accident or a mistake. Which is tricky. The game hit the table occasionally for a while, and then the expansion hit. So I love this game. A lot. It's easily one of my Top Ten of the last few years. But the expansion takes everything I love and turns it up even higher. It increases player count, adds some new rooms, and gives each character a special ability. Each player also gains an "Adrenaline" token that you can program to take a third action at some point during the game. It also has a chart with some suggestions for building the complex in certain ways. This game now hits the table almost every week. It rewards smart play and cooperation, and players who can think, plan, and communicate well will find it both challenging and fun.